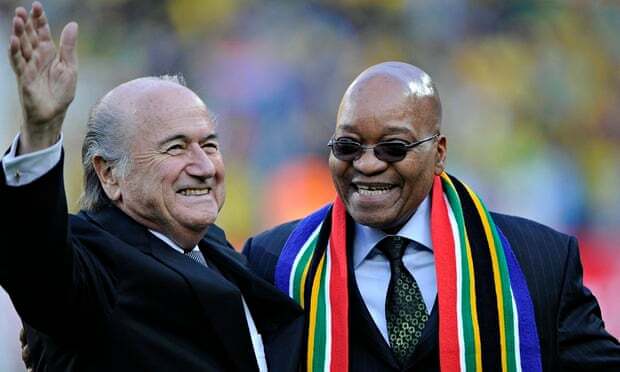 Sepp Blatter, seen here with South Africa’s president, Jacob Zuma, has widespread support from the African continent. African countries will vote overwhelmingly for Sepp Blatter in this year’s Fifa presidential election, senior officials said on Tuesday. “Africa is solidly behind Blatter. You will find he is very popular on the continent,” said Kwesi Nyantakyi, the president of the Ghana FA and a Confederation of African Football (Caf) executive committee member. Blatter faces four challengers in his bid for re-election on 29 May, when he seeks a fifth term as president, which would take him past his 80th birthday. Previous endorsements from Caf, however, have not necessarily translated into votes. African football’s controlling body promised Lennart Johansson a block of votes in 1998 but member associations took no heed and helped Blatter to victory. In 2002, the Caf president, Issa Hayatou, failed to muster significant support from his own continent and lost heavily by 139-56 votes at the Fifa congress in Seoul. Affection for Blatter stems from the generous financial assistance he has given Africa during his 17-year tenure. “He has done a lot for the continent. It is he who has set up the financial assistance programmes and who through the Goal project has built infrastructure in all of the countries,” added Nyantakyi. Goal is Blatter’s pet project, inaugurated not long after he came to power in 1998. It has built training centres, accommodation, pitches and offices for cash-strapped associations. Under Fifa’s financial assistance programme, introduced in 2001, each of the ruling body’s 209 member associations receive generous grants with more than $1bn (£660m) paid out during Blatter’s tenure. The Dutch FA’s president, Michael van Praag, announced on Monday his intention to run following similar moves by the former Fifa deputy secretary general Jérôme Champagne and Prince Ali bin al-Hussein of Jordan. Prince Ali has welcomed Van Praag’s decision to enter the presidential race, describing him as a “credible candidate” who will add to the debate about the future of world football’s governing body. “We welcome other credible colleagues from the football family who want to join a genuine debate about the future of Fifa,” Prince Ali said in a statement on Tuesday. The former France international David Ginola is also standing in what is widely regarded as being a publicity stunt. But Blatter’s prospective opponents are likely to get little support from the 53 African voters. Posted on 27th January 2015 by newsafrica. This entry was posted in Africa, FIFA, Football, Sport. Bookmark the permalink.